The Centre For Public Policy Alternatives (CPPA) is holding a dissemination seminar on “the Public Policy Implications of Wealth and Income Inequality in Nigeria” at the Ford Foundation in Lagos, Nigeria on October 11, 2018. The aim of the seminar is to share results of a study on inequality carried out by the CPPA and drive a conversation around some of the causes and manifestations of inequality in Nigeria. 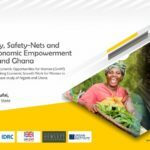 The event is part of a dialogue series on the 21st century challenges of African economies, funded by the Ford foundation. The event is moderated by Mr. Ademola Adigun, Technical Lead, Facility for Oil Sector Transparency and Reform in Nigeria (FOSTER). The presenter is Professor Melvin Ayogu,Visiting Senior Fellow-in-Residence at CPPA and a follow-up panel session featuring Mr. Paul Arinze, General Manager, Government and Public Affairs, ExxonMobil and Mr. Pete Onyia, Deputy Commandant (retired), Nigeria Customs Training College as lead discussants. Attendees present are from government institutions, private organisations, civil society and members of the press.